For most of my readers, today, National Record Store Day, was redundant -- but participating in such a fabricated event was salvation. I've never seen Used Kid's so crowded, almost like it was a Toys R' Us with the Breakdancing Elmo. Kids lined up with arms-full of dollar Carly Simon and ELO between the bands, and random dudes who would actually make their transaction while the band was playing (see the video) buying cds. Kinda' glorious. The readers know the value of the independent record store. They're the same people that go there week by week, and treat the internets with the same consistecy.Why? Cause we'll find it one way or another. I cut each and every one of my teeth in that store, whether it was underground or a story above. I suppose the rest of the world (who are on the internet more than on the street) need an alarm call that a vital resource to the community is being laid waste to the instant-free-access of P2P and MP3. 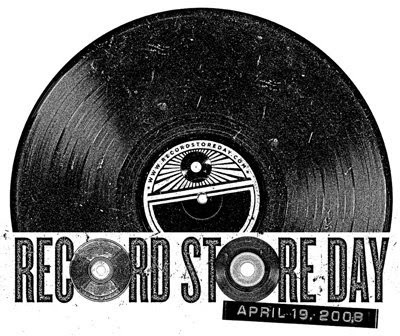 Hence, Record Store Day. It's certainly a holiday I can get behind, if only it makes cute girls buy vinyl for their dorm room's new turntable. Wil Foster of the Guinea Worms certainly knows the importance. The record store is the crossroads between the living room, the bar, and the library. Here Guinea Worms do "In My Area" by the Fall. BONUS: Go Here for the new Guinea Worms reggae jam -- "After Our Party," living proof that they're finally listening to Journey. Or my favorite "Electric Moreland Funeral" -- Foster doing Sabbath. Maybe So, Maybe Not.